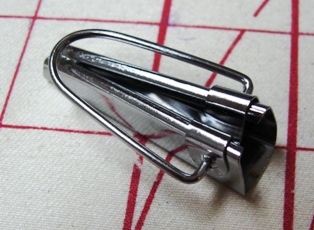 You can make small bias binding yourself—all you need is a quarter-inch bias tape maker and your iron. Directions come with the maker—you simply cut a strip of fabric on the bias, run it through the bias tape maker and feed it under your iron to press flat. These handy tools are popular with quilters and can probably found in any quilting shop. And the best thing is, you can make bias of any suitable fabric and match the binding to your fashion fabric exactly! A bias tape maker will allow you to make custom bias tape.